January 19, 2013 (LocalOrg) - Worried about draconian Internet laws? Creeping surveillance? The inability to share with others without being criminalized? The Internet is still a tool of tremendous power, but a deep rot has set in. We have caught it early and we are fighting to stop this rot, but there are other options we can begin exploring to hedge our bets, enhance our current efforts of fighting against corporate monopolies, and eventually, build an Internet of the people, by the people, for the people - big-telecom monopolies not welcomed. In last week's "Fighting Back Against the "Intellectual Property" Racket," the "PirateBox" was introduced. The PirateBox transforms a laptop, router, or single board computer into a mini-Internet hub where files can be freely shared, and even features a chat program so users can communicate. It is a lite version of the mesh networks described in December 2012's "Decentralizing Telecom" where independent mesh networks featured many software alternatives to emulate popular online programs such as Facebook, Twitter, Blogger, and others. The PirateBox is an introductory project anyone with a WiFi adapter and a USB thumbdrive can do on their own with a little motivation and an hour to experiment. In a busy office, a PirateBox can serve as a simple local wireless file server and chat client. In an apartment complex, it can become the center of a social experiment, an opportunity to reach out to neighbors and organize constructively, or just for fun - building badly needed local communities back up. Instructions for perhaps the easiest of PirateBox's implementations can be found on blogger, designer, and activist David Darts' website here. The instructions are nearly fool proof, and a lot of the common problems ran into are described and their solutions linked to throughout the explanation. The PirateBox does not connect to the Internet, nor does it operate from your hard drive. It works entirely on the USB thumbdrive you install it on, simply using your computer's WiFi to network all who are in range. Ideally you'd want to make a dedicated, standalone PirateBox to serve your space, office, and neighbors. A great place for beginners to embark on this is at your local hackerspace. If you don't have a local hackerspace, look into starting one up. Protesting is important, but protesting alone will not stem the problem at its source. The rot will continue to spread unless we develop tangible tools to pragmatically excise it and repair the damage it has already done. The problem of corporate monopolies ensnaring and subjugating us through their telecom monopolies can and is being solved by solutions like mesh networks, the PirateBox, and the onward march of open source software and hardware, simply displacing proprietary products and services. The best way to ensure success is to have as many informed and constructive people as possible join in the problem-solving process. Editor's Note: There seems to be some confusion over the concept of the PirateBox. The entire point is not to be connected to the controlled, restricted, & monopolized Internet, and begin using local alternatives leveraging technology to go around draconian laws and regulations. 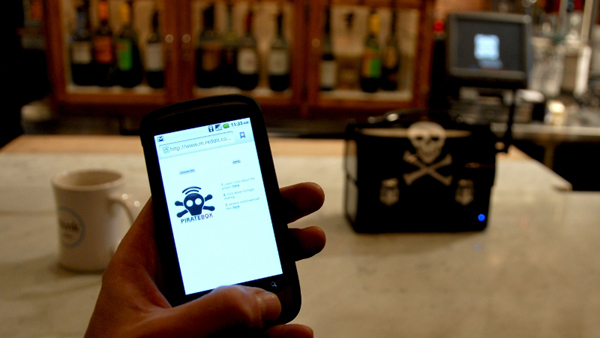 A PirateBox is the smallest, but easiest way to connect with others locally and wirelessly,as well as anonymously, without connecting at all to the Internet. It is the first step to building larger local mesh networks, and eventually a parallel Internet built using mesh architecture designed, maintained, and used by the people, for the people - no government or corporate infrastructure would be required, and the means of monopolizing and controlling a decentralized people's Internet made nearly impossible. Think of the PirateBox as a prototype of a building block for something bigger and more significant. In the fight for freedom, we will not find complete solutions, prepackaged and waiting for us on the shelves of WalMart. We will have to research and develop our own solutions, patiently, incrementally, and in collaboration with our friends, family, neighbors and local community. Our problems were not created overnight, neither will the solutions.